Prestige Construction LLC has been in the general contracting business in Valparaiso since 2003. We have worked on many residential and commercial construction projects in Porter county, Indiana. Prestige Construction LLC has built a solid reputation in Valparaiso, completing home additions, new construction, kitchen remodeling, bathroom renovations, and basement remodels for countless satisfied clients. We're dedicated to making your construction and remodeling dreams come true with the best value for your dollar. 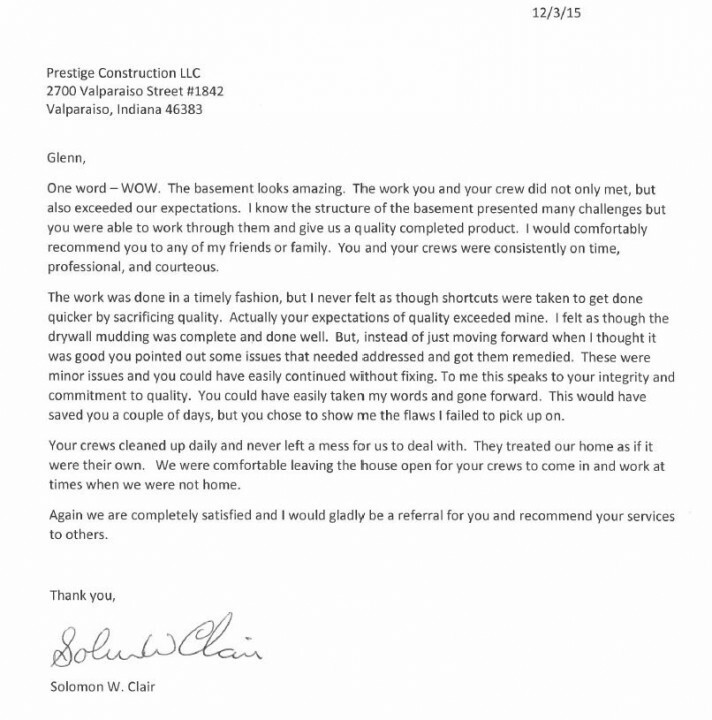 Prestige Construction LLC is deeply committed to the Valparaiso community and to making lives better. Our mission is to do the best job possible, make sure our customers are 100% happy, and to donate a portion of the profit from each project to either a local charity or to an organization that promotes missionary work in other countries. Looking for a General Contractor in Valparaiso, Indiana? Whether you are considering a home addition, or a deck, cost and billing procedures are major factors. Prestige Construction LLC remains competitive in the Valparaiso market and provides clients with detailed costs every step of the way. When partnering with Prestige Construction LLC, homeowners understand the work their Valparaiso general contractor is doing and exactly what they’re paying for. Our job is to oversee every aspect of your construction project and make sure that it's done right. All work is done in compliance with Valparaiso, Porter, and Indiana code. We handle permit acquisition and will be on site for all inspections. For leading service and a commitment to the community, you need a general contractor in Valparaiso, IN that you can trust. Prestige Construction LLC offers the reputation you want in a contractor, along with the detailed billing and performance you need. Call (219) 213-6336 today to find out how Prestige Construction LLC can help you build your dreams.